RD Series double-acting cylinders are ideal for heavy-duty operations, including shipyard, utility and mining equipment maintenance, bridge lifting and building reconstruction. The load cap moves out to expose internal piston rod when pulling is required. A built-in safety relief valve protects against over-pressurization of the retract circuit. For the heaviest duty tasks, you’ll need one of the finest double acting hydraulic cylinders from our range to complete work to the best standard. Single acting cylinders are great for many purposes, but a double acting cylinder is required for shipyard, mining and utility maintenance, bridge lifting and building reconstruction. Everything from a 10 ton to massive 400-ton hydraulic double acting cylinder can be found here at SGS Engineering. Simply use the capacity filter on the side of our site to narrow your search or manually browse all the options below. Each double hydraulic cylinder features aluminium bronze overlay bearings that provide long life, while the chrome-plated piston rod is more resistant to corrosion than other metal alternatives. 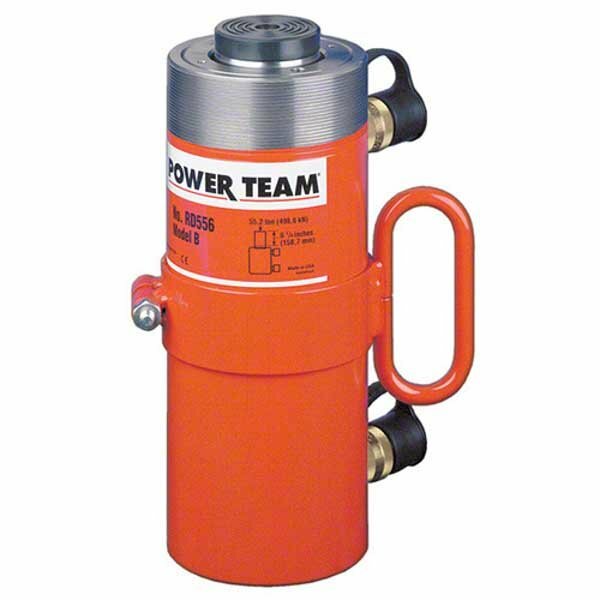 As heavy duty hydraulic cylinder double acting tools, the load cap is designed so threads withstand full loads too. A built-in safety relief valve is present in each one, protecting against the risks of over-pressurisation of the retract circuit. Plus, all double acting hydraulic cylinders for sale are highly durable and have been manufactured by SPX, one of the leading brands in the industry. To find a double acting cylinder that will fit in with your needs, browse the ones that are available in our online store or call our technical sales team on 01332 576 850.